The formation of self-organizing molecular patterns in cells is a critical component of many biological processes. LMU researchers have proposed a new theory to explain how such patterns emerge in complex natural systems. Many biological processes are crucially dependent on the formation of ordered distributions of specific molecules within cells. These patterns are self-organizing structures that evolve in a predictable fashion in time and space. Perhaps the best known example of intracellular protein patterning is the molecular machinery that orchestrates the regular segregation of complete chromosome sets to the two daughter cells during cell division. The classical theory of pattern formation is based on chemical systems that are close to equilibrium. But such states are seldom encountered in the physical, chemical or biological systems in which self-organized patterning is typically observed. As a rule, these systems are found to be very far from equilibrium, a state maintained by the input of energy. The mechanisms that create and stabilize ordered structures under these conditions are poorly understood. 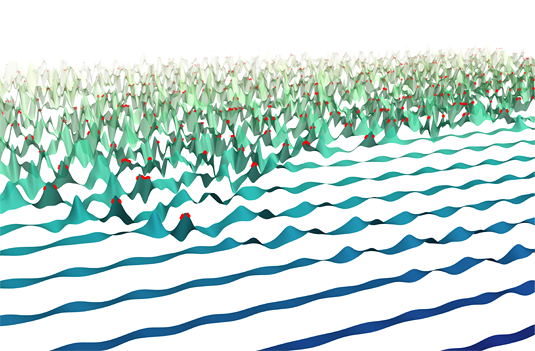 LMU physicists Erwin Frey and Jacob Halatek have now introduced a new theoretical framework that can account for pattern formation in non-equilibrium systems. The new theory is described in the journal Nature Physics.